Bottom of the funnel: How Do I Convert More Prospects? I Want To Improve My Conversion Rate: What Do I Do? How Does The RetargetLinks Pricing Model Work? Hello and welcome to the RetargetLinks helpdesk! We are here to help answer your most commonly asked questions. Don't find an answer here? Submit a Request or Email us directly and we will get back to you within 24 hours! Are you struggling to reach more people? If you are looking to start or grow your funnel with RetargetLinks, you have come to the right place. Here are paid and organic ways for you to reach more people, increase brand awareness and grow your audience! This is the quickest way to grow your funnel and increase brand awareness. RetargetLinks allows you grow your audience while providing your users with exactly what they want: valuable content. Facebook is the one platform were 2.23 billion people spend their time connecting, communicating and looking for content to consume. One way to reach your audience within Facebook is to advertise to the Facebook community. Now whilst you could use self-promotional ads, what has provenly worked better is promoting content that is valuable to your target market. Content not only allows you attract more users, but also allows you to segment your audiences in ways that Facebook might not allow you to. Here is a hypothetical example from Pantene to get you started. Pantene wants to segment out users that have curly hair in order to advertise their new curly hair product line. 1) In order to reach the right audience, they pick an article in Cosmopolitan that is specifically for curly haired individuals: 18 Life-Changing Hacks for Curly Hair. They then shorten the link using the RetargetLinks system. 2) They then proceed to add this link to their Facebook ad. They add the RetargetLinks shortlink in the 'Website URL' field and the Cosmopolitan URL in the 'Display Link' field. The reason the URLs are added in this way is because the 'Website URL' field is the one you want to add your destination URL in. By adding the RetargetLinks URL into this field, you are able to tag the users that click on the URL and redirect to the final third-party article. And, by adding the third-party link into 'Display Link' field, you are able to leverage the brand's name and reputation as well as make it very obvious that the ad is promoting content and is not self-promotional! The two key components you will need to set up a campaign are an active Google AdWords campaign, and a RetargetLinks account. 1) Edit the campaign by clicking the edit/pen icon as shown here. To insert a retarget link in your Google AdWords campaign, click the edit button as shown above. In this case, we are using Dave Knox’s campaign for his new book on Corporate Venture “Predicting The Turn”. The ad points to the Amazon store where the book is sold. 2) Once you are in the ads dashboard, click on “Ad URL Options” (Advanced) to insert a retargeting link. Remember, you can generate a retargeting link within your RetargetLinks dashboard. Click on “Ad URL” to insert your retargeting link in the short URL field. In this case, we inserted the retargeting link: re.tc/amazon-dave-knox-predicting-the-turn. 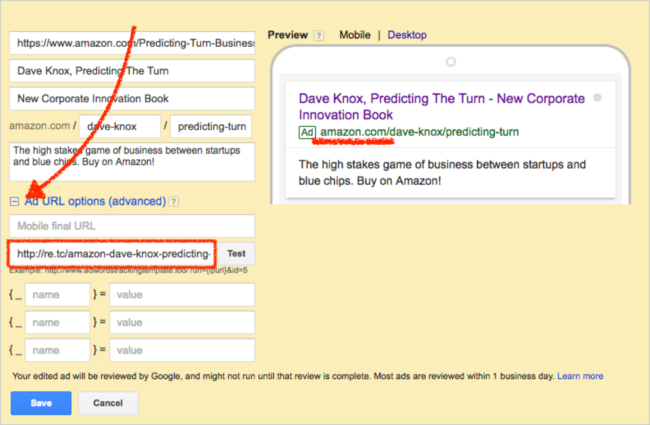 Note one rule to remember: The domain name that appears in the ad (https://www.amazon.com/dave-knox/predicting-turn) must be the same as the destination domain name of the short link. In this case (shown below), the domain names are both Amazon so the test will succeed. Make sure the domain name of the AdWords ad is the same as the domain used to generate your short link (shown above). If you are looking to grow your audience organically, here are a couple of tips and tricks that will help you reach more of your target audience! Bonus tip: Add in our Chrome Extension so that you never have to remind yourself to shorten a link again. With LinkedIn and Twitter not allowing you to edit your posts after they go live, the Chrome extension can be a life saver! Struggling with getting more conversions? Check out this article: I Want To Improve My Conversion Rate: What Do I Do? We hope this article was helpful in providing insight on where and how RetargetLinks can integrate into and boost your current marketing strategy. While these are just some tips and tricks from our best performing clients, we have a bunch more in the roster. If you have a niche market and want more personalized information on how to create an efficient marketing campaign for your product, feel free to shoot us an email at hello@retargetlinks.com for a free 1:1 session!